Neil's account of live announcing on the biggest show on television: the "Academy Awards," is recounted with 'extremely accurate, hilarious, and intimate behind the scenes candor. A terrific read, and I should know, I was there. director of the "Academy Awards"
Like a lot of folks who hire voiceover artists, I hire Neil Ross because he makes me look good. My bosses foolishly think I'm a great director when all I've really done is call Neil's agent and then at the session, I "direct" Neil by telling him which microphone to use. If I were an aspiring voice talent, I'd study his book and try to figure out how one gets to be that skilled and that dependable. Neil Ross has a spectacular voice -- and I'm not even talking about the instrument that produces sounds. His creative "voice," his world-view and ability to communicate it are what really elevates him to spectacular status. That's the voice you'll "see" as Neil takes you on the wonderful, personal, funny, and inspiring journey of his life. Enjoy! It's pitch perfect! -Ken Levine, Writer/producer "M.A.S.H.," "Cheers," "Frasier," "The Simpsons." How does a kid who survives the rain of V-2 rockets on London in the waning years of World War II, end up in Hollywood announcing the Diamond Jubilee of Oscar? 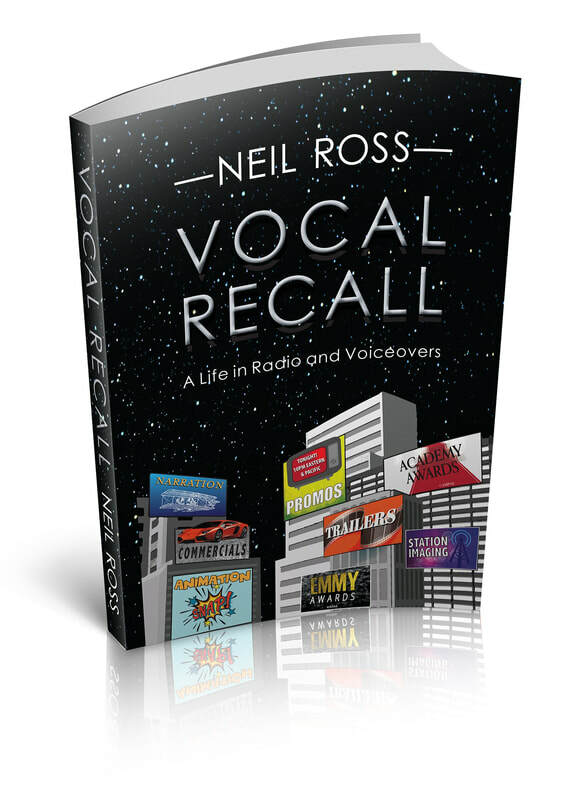 Veteran Hollywood voice actor Neil Ross tells the amazing story of his life, and fifty-plus year career, in two exciting, highly competitive professions in his autobiography: Vocal Recall A Life in Radio and Voiceovers. Driving cross-country to New York at 17, Neil learns how to survive in the Big Apple on $38.06 a week, and then lives the life of a radio gypsy: Arizona, Salt Lake City, Honolulu and Saigon, where, as a Navy Journalist, Neil reports on one of the major disasters of the Viet Nam War. Then on to San Diego, San Francisco and finally, Hollywood. Neil tells of his struggle breaking into voiceovers, one of the most competitive fields in the industry. Then describes in fascinating detail what it was like to work on iconic 80’s and 90’s TV cartoon shows including: Transformers, G.I. Joe, Voltron and Spider-Man. As well as a slew of popular video games including: Metal Gear Solid, Call of Duty, Command and Conquer, Doom 3 and Mass Effect. Neil spins the tale of his 30-plus years in voiceovers including major motion pictures and television shows, and encounters with Robert Redford, Warren Beatty, Steven Spielberg and Jerry Seinfeld. In addition to announcing the Diamond Jubilee of Oscar, Neil also works on the Primetime Emmy Awards and seven AFI Life Achievement Award telecasts. He describes in vivid detail the adrenaline pumping experience of working on live, celebrity-studded events. As Neil’s story unfolds, we meet an amazing cast of characters: from Gene Autry to Jim Morrison, Little Richard to Jonathan Winters. Neil also shares his experiences with the many colorful, talented voice actors and directors he’s worked with over the years, and shares stories of hilarious in-studio hijinks. Readers curious about the life of a top 40 radio DJ in the heyday of that format, fans of the many cartoon shows and games Neil has worked on, and the many beloved characters he’s voiced, and folks dying to know the inside scoop on the golden age of the voiceover business will want to read this fascinating story.